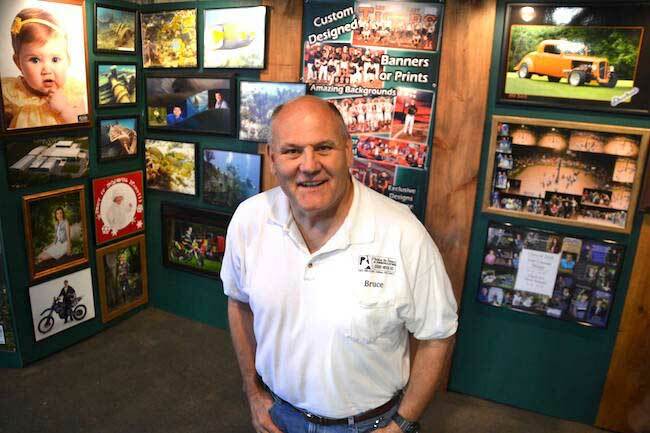 Photo by Tom Rivers: Bruce Landis is pictured in July at the Orleans County 4-H Fair with a display of his portraits, commercial photographs and other work. Landis, 61, has worked locally as a photographer since 1974. As a kid growing up near Lyndonville between Waterport and Kenyonville, he worked on a small dairy farm owned by Don and Linda Hobbs. They later sold him the site at 13382 Ridge Rd., the base of his photography business since 1978. When Landis was thinking about a career as a teen-ager, his former pastor at the Kenyonville United Methodist Church urged him to follow a passion. For Landis, that was taking pictures, even back then. He graduated from the Rochester Institute of Technology and started his photography business, Photos by Bruce, at age 17 in 1974. Question: Why have you stayed with this for 43 years? Answer: I love photography. The adrenaline rush of people able to take someone who says, ‘I hate having my picture taken’ and to be able to get something that they absolutely love in end is really great. I love that. It’s very rewarding. One of the most rewarding things I do is when I photograph a special needs person. It’s a challenge because you never know exactly what the parents expect. When you get something that you love and they love, and it brings tears to their eyes, you don’t have to pay me for that. That’s all the payment I need. Question: I know you do a lot of Little League teams, dance studios, weddings, groups and portraits. Answer: One of our specialties is large group photos. It’s a lot of work to do that. If I take an assistant or an intern with me, they are always surprised that the photography part for a class reunion is maybe four or five minutes, where the setup, if you have to build some type of risers, might be 45 minutes or an hour. Question: In looking at many historic photos, it seems people put a high value on nice portraits over a hundred years ago, whether a man in his shop or even the sports teams from decades ago. Back then, they wanted a professional to take the photos. Bruce Landis gets a group of Albion honor grads ready for a picture in May 2016 during a convocation at Hickory Ridge Country Club. Answer: Yes, that’s true. And the selfie has degraded the level of acceptance of what people will think is good. They’ll take a selfie and a duck flips and think, ‘Wow, this is great. I love it.’ So someone comes along with a Smart Phone or picks up a camera at BJ’s and thinks now I’m a professional photographer. Or they may take something that’s a little bit better than a selfie, and not see beyond that. A lot of times people will look at two different photos and not know why one is better than the other. But they will look at one and say, ‘This one is so much nicer and I don’t know why.’ It’s like with retouching. If you can tell a photo has been retouched, you’ve overdone it. You want it to look natural. I want a natural, real look to photos, rather than the plastic, and overdone. Question: Not only are people OK with selfies, but they don’t seem to print out pictures very much. What I’ve noticed in the news business, even for obituaries, many people do not have a good picture of a relative. I think about the old days, over 100 years ago, it seems like families insisted on having a good picture of their uncle or whichever family member. Answer: The printed picture is invaluable. The Professional Photographers Association of America right now has a program where we are trying to promote people to actually print their photos. I talk to people everyday where they have photos on their cell phone and they show me. I say, ‘Do have those backed up someplace? Are they any place other than your phone?’ Because when you walk out of here , you could drop your phone in a mud puddle or step on it or break it or something. People say they are on the cloud, but the cloud is hackable, or you could lose a connection. It’s better than just having them on your phone. But get them on your computer or back them up to a CD. Or make real photographs. Question: Did the Chamber give you a sense with why you are getting the Lifetime Achievement Award? Answer: No. I thought I was kind of flying under the radar. Bruce Landis took this senior portrait of 2015 Albion graduate Aaron Burnside. It won first place in an international competition by the Professional Photographers of America. Question: Well 40 years is a long time of capturing important moments. Answer: You hear in schools about the number of times people will change jobs. Well for me it was working on a dairy farm as a youth, as a teen-ager in school. When I was going to RIT, I worked at a fish market in Greece, NY, and then I became a photographer. So that’s three climbs in 40 years. I think I’m on the low end of the average. Question: It seems like photographers tend to come and go, especially if you try to have your own location or building for the business. I think one change for the professional photographers might be, I don’t want to call them hobby photographers because they’re better than that, but people who do it as a side business. It seems like that might undercut you for the portraits and weddings. It seems likes there are a lot of those photographers working at it as a part-time business. Answer: There are. It is easy to get into. Weddings seem to be an introductory way to get into the business for a photographer. Well, some couples don’t feel like they have money, but they have a friend who has a nice camera, so they decide to have him take their wedding pictures. And that’s something where if you take a portrait of somebody and they don’t like it, you can take it again. But if the bride is walking down the aisle and she looking down or something’s not right with that, you can’t do it again. People need to understand the importance or if they have an idea that this is the most important time of my life, then I want it documented properly. The other thing, you can’t walk into a wedding, or any job, without backup equipment. I always have two of everything. It’s mechanical. 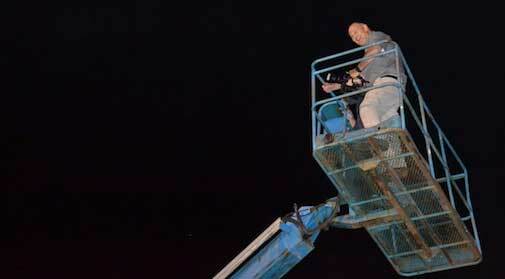 Landis is shown in a lift last July trying to get a nice photo of the grease pole competition. Question: Has it got easier with digital because you don’t have to change the film at a wedding? Question: I know when I took wedding pictures, I had to be thinking ahead and time it so I had enough film for when the father was walking the bride down the aisle. I had two cameras going, actually. Answer: We used to photograph the high school graduations. Question: That would be tough with film with hundreds of kids. Answer: At the time I’m working with a camera that had 15 exposures on it. I had the inserts of the camera lined up on the floor next to me. I just grabbed the next one, put it in, and winded it in between the announcement of one student to the announcement of the next person’s name. I had a real good relationship with the person that was doing the announcing. They would watch me and they would nod, or I would nod and say I’m all set. Father Csizmar was real good with that, too, back in the days of film. He would pause a little bit while I was changing film while I photograph First Communion kids. Question: I’m impressed in observing you that you still have enthusiasm in taking pictures. You’re not just going through the motions. Answer: You know when my wife (Sue) retired, people asked me if I was going to retire, too. I said, ‘If I retire, I’d want to take pictures so why should I retire?’ I’m going to keep on doing what I’m doing because I really do enjoy it. We do some underwater photography, part of it is portraits, but the major portion of that is commercial photography. That sparked an interest because I am a professional scuba diver also. Question: Yes, I was going to ask about that. Answer: I started in 1974. 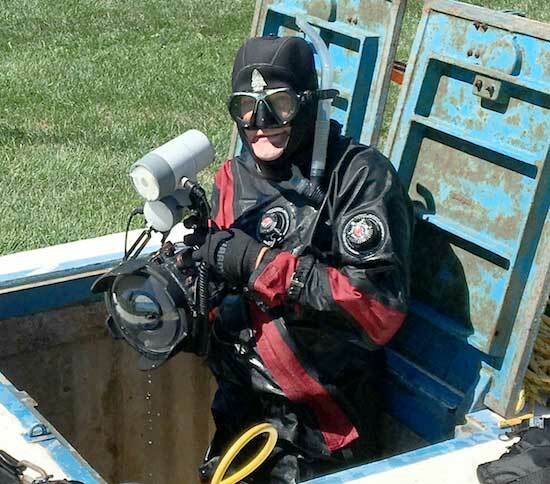 There was a scuba diving course over at GCC in Batavia. I was originally certified there. You can’t dive alone. There was no one to dive with so I kind of let it slide until my daughter got into college and my son into the Navy. They were both learning to scuba dive. (Bruce retook course with his daughter, Liz, in 1990s.) I’ve since taken all kinds of courses. I’m certified to dive under ice in the wintertime, and as a rescue diver after taken a search and rescue course. Something I never want to use, but I’m also certified with First Aid, and oxygen administration. You never want to use any of that, but if I had to, I have the certification. Provided photo: Bruce Landis is also a professional scuba diver. We also do a lot of aerial photography. I was talking to a realtor the other day, and there’s a property I’ve done an aerial photo for the owner. They had a photo taken by a drone. Most drones are like really wide camera angles. With the background it looks like you can see the curvature of the earth. The buildings are all leaning to the side. It’s not the right angle. I called and said I would be happy to let you use this photo because that (one taken by drone) is not a good representation of the property. The realtor is going to get her own drone. I told her I would help her with the settings so you don’t get the distortions. Question: Is there a favorite part of being a photographer? Answer: There is nothing like taking someone who is shy, their chin is against their chest and you just barely get them to look at you through their eyes, and you get them to overcompensate, you do something up by the ceiling so its gets their face up to the camera, then you come down quick and their eyes come back down and you have a split second to get the photo before their chin goes back to their chest again. Question: That is a good gift for their family, to have that picture forever. It seems like you’re willing to get on lifts, and ladders and you-name-its. It isn’t just a matter of pointing the camera at someone. Answer: This is true. I remember years ago when they were bringing fish to Lake Ontario. I remember looking at that and thinking the best angle really would be out in the water. There wasn’t a boat available so I ran to my car and changed into my not-so-good clothes. I walked out into the water with my expensive film camera. I love the photo because you see the fish coming out of the pipe into the lake. You see the people and the observers and the workers. You see the truck, and the American flag in the back. That was the picture. You try to visualize. Every picture I take I see it in my head before I take it. I say that’s how it ought to be, now I need to do the chemical part to get it there. Question: There is definitely an artform to being a good photographer? Answer: One of the most important things is to have a knowledge and be comfortable with the technical aspects of it so you’re not thinking about, ‘Do I need to put this light here, do I need to change this setting?’ That stuff all becomes automatic. It’s like breathing. You know what you need to do and you do it automatically. Question: Why do you go to the Orleans County Fair every year, for the entire week? Answer: I see people there I don’t see, except at the fair. I see some of my classmates. It doesn’t matter how much advertising I do, unless people see the actual photographs, they might realize this is different than their selfie. They might see I do aerial photos. They will see there are photos underwater and they may ask where I took that. So it gives people a chance to see my wares. We also have 60 to 80 photos over at the nursing home. They’ve been up there for years and years since they did the addition (completed in 2007). I asked them, ‘What are you going to put on the walls?’ and they said they didn’t know, that it was a real expensive process to get artwork. I told them every year at the County Fair we have about 40 feet of wall space that is 8 feet tall that we fill with photographs. In the studio I can hang up about eight of them in my reception area. I have an archives full of photos. We put them up at the Nursing Home and they have been there for many years. I was thinking of taking them down or changing them up, but a lady came up to me that is the last few days of her mother’s life, all that she could talk abut was that family portrait outside of where her room was and how she really felt like those people were part of her family and life. It just really touched me that images can have a profound effect on someone, especially in the last part of their life. Question: Why have you stayed in Orleans County, Bruce? Answer: I love it here. It’s where I grew up. It’s where I know people. I’ve worked for other photographers. Different photographers will call up and say, ‘Hey we need some help, can you photograph this wedding on whatever date?’ So I’ll go into the city. People tend to be, do I dare say more honest, more appreciative of what you do here. In the city it’s more cutthroat. I can get probably double the price if I go into the city, but it’s not about the money. Our tagline is, ‘Creating for you memories that last a lifetime.’ And that’s what I do and what I want to do. I don’t want to get into cutthroat in downtown Rochester or Buffalo. Question: It seems like a lot of weeknights and weekends. Answer: I didn’t do too bad with the kids while they were growing up with their sporting events and so on. But Saturdays you could be out 10 to 12 to 14 hours for a wedding and then Sunday it’s hard to stay awake in church. Then you’re kind of dead to the world on Sunday when the kids want to do something. There are a lot of 6- and 7-day weeks, but then again I like what I do. I just love creating memories for people.